Schools Show - A Huge Success! Home / News / Schools Show – A Huge Success! Schools Show – A Huge Success! Well, what a week last week was! 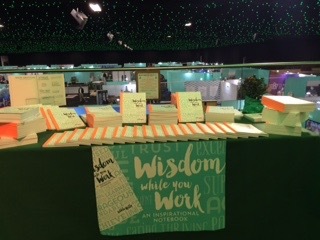 My little book flying off the shelves at the Gift of Sight Fair for Order of St John – 85 sold and then something completely different the Independent Schools Show. It was fabulous talking and sharing with Heads and teachers and child psychologists, seeing what age groups would benefit from my book. What I loved is that they took it seriously and viewed it as a real help for the young to be learning the messages in my book. I was overwhelmed at the positivity and warm reception I was given. I have orders, I have talks to give and school fairs to attend. Wisdom While You Work is truly born! Hurrah!